Are you curious about cycling in group cycling but have not yet bought your own bike? Do you want to experience Gothenburg and especially Hisingen with its nature in a new and beautiful way? If you do not have a race bike but would like to try it out, take the chance to test one of our loan bikes. 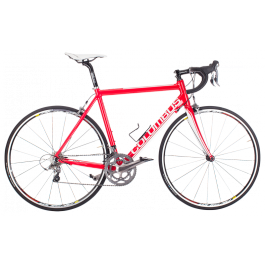 To borrow a bike costs nothing so now you have the chance to borrow a racing bike ** before going to a bicycle shop and buying a new bike. We have bikes for lending primarily to our introductions from the clubhouse. These are intended for approximately: 150-185 cm long cyclists and have combo pedals so it works with regular shoes and / or SPD clips *. Booking is via notification in the intended thread on our Facebook page (first come first served). You who want to try come 15 minutes before the start of the round so that we can adjust the height of the saddle and make you familiar with gear and brakes. The smaller bikes (3pcs) have Campagnolo as components and the larger (3pcs) have Shimano. All bikes have aluminum frame, carbon fork and handbrake (no foot brake). * = same “bricks” most commonly found on mountain bike and spinning bikes. ** = Insurance is not included in the cycle loan. We do not have a bicycle rental, but it is possible to use our loan bikes in connection with rounds that starts at Klubblokalen.